MadgeTech, along with Che Scientific Co. is helping facilities in China ditch the cords, gowireless and remotely monitor real-time data. Che Scientific, based out of Hong Kong, is now offering an easier way to manage and monitor environmental parameters with MadgeTech’s state-of-the-art wireless series of data loggers and MadgeTech Cloud Services. With many years of expertise, Che Scientific continues to expand offerings of data logging products and solutions throughout all of China as the premier distributor of MadgeTech for this region. Che Scientific also operates through subsidiaries Shanghai Xiang Ke Scientific Trading Co. Ltd in Shanghai, Zhejiang Fortune Scientific Co. Ltd in Zhejiang Province, and Zhejiang Fortune Scientific Co. Ltd. Guangzhou Branch Co. in Guangzhou. All MadgeTech Wireless Data Loggers are compatible with the new MadgeTech Cloud Services, allowing users to view or download data remotely on any smartphone, tablet or internet enabled device. The newly released RFC1000 Cloud Relay transmits real-time data from wireless data loggers directly to the MadgeTech Cloud using a built in Ethernet connection for internet access, no computer needed! This winning combination offers a simple, seamless and scalable continuous monitoring solution. Che Scientific has added the RFRHTemp2000A wireless humidity and temperature data logger to its growing selection of MadgeTech products. 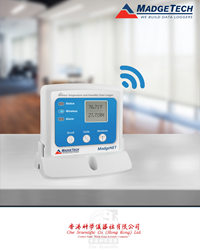 The RFRHTemp2000A wireless data logger measures both temperature and humidity and is ideal for monitoring conditions in industrial facilities, laboratory environments and much more. Che Scientific also delivers a wide selection of stand-alone data loggers and the multi-lingual MadgeTech Data Logging Software, packed with data analysis and reporting tools that aid users in meeting compliance and regulatory standards. For autoclave monitoring and steam sterilization cycles, Che Scientific offers the HiTemp140 data logger series. The rugged stainless steel design makes the HiTemp140 a popular choice for high temperature monitoring and validation. The series includes a wide selection of probe lengths and styles including dual probe models or M12 connectivity with interchangeable probe options for application flexibility. Applications that require monitoring several temperature sources simultaneously are simplified with the OctTemp data logger. This device gets the job done by providing eight channels that monitor and record up to 500,000 data readings per channel. As the partnership between MadgeTech and Che Scientific enters into its 10th year, the growing success clearly stems from a mutual devotion to providing users with cutting edge and simple monitoring solutions in ever-changing times. To see more MadgeTech product offerings available throughout China, contact Che Scientific directly.